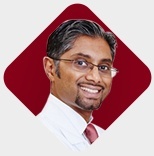 Dr Chacko is without a doubt, the best Pain Management Doctor i have ever seen. He spends time with you, listens to your questions, answers them in a understanding way. I have been in serious pain for the last 18 years, today, i am almost pain free. I would recommend Dr. Chacko to anyone who is looking for pain relief without pain meds. I finally have my life back ! THANK YOU.